The purpose of the Thumb CMC Grind Test is to assess the integrity of the thumb CMC joint. Reproduction of the patient's pain and crepitus is a positive test for arthrosis and synovitis. 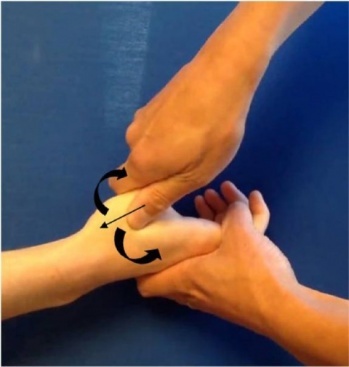 Therapists must be aware of the crank test which both evaluates the joint quality and translational laxity, the distraction test where a pain response indicates joint inflammation and volar compression of the first metacarpal base which also indicates joint inflammation. The grind test is performed by gripping the patient's metacarpal bone of the thumb and moving it in a circle and loading it with gentle axial forces. A patient with thumb joint arthritis generally complains of a sudden sharp pain at the CMC joint which can also be associated with Crepitus. This indicates a positive test.